The exhibition will feature ten major paintings, ranging in date from 1956 to 1992, and is timed to coincide with both the ten-year anniversary of her death, and the forthcoming Retrospective exhibition at the Whitney Museum of American Art. Born in Chicago in 1926, Mitchell graduated from the School of the Art Institute of Chicago in 1947. She moved to New York with Barney Rosset, then a filmmaker, later the founder of Grove Press and whom she would briefly marry. Mitchell and Rosset spent a year in France in 1948-49, and she began to paint abstractly. The pair returned to NY in 1950, where Mitchell's career quickly took off. She exhibited in the famous "Ninth Street Show" in 1951 and had her first solo gallery exhibition in 1952. By the second half of the decade she was well established, with a feature article on her work in Art News in 1957 and a reproduction on the cover of that magazine in 1961, and major paintings in the collections of the Albright-Knox, the Whitney, the Art Institute of Chicago, and the Museum of Modern Art. Mitchell began spending part of the year in Paris in 1955, moved to Paris full time in 1959, and in 1967 bought a house in Vétheuil, a town on the Seine about an hour outside the city, where she lived and painted until her death in 1992. 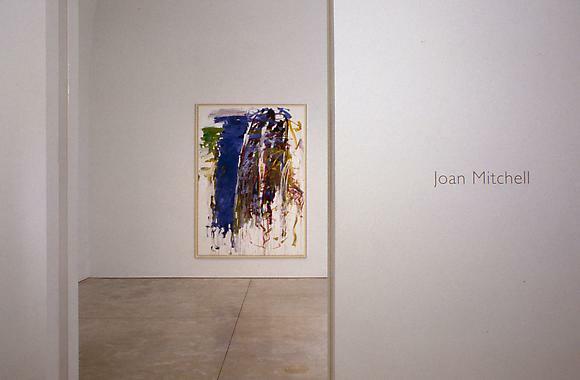 Museum exhibitions of her work prior to the forthcoming Whitney retrospective have included, "My Five Years in the Country" at the Everson Museum of Art, Syracuse, NY, 1972; "Joan Mitchell" at the Whitney Museum of American Art, 1974; "Joan Mitchell: Choix de Peintures 1970-1982" at the Musée d'Art Moderne de la Ville de Paris, 1982; the traveling retrospective "The Paintings of Joan Mitchell" organized by the Herbert F. Johnson Museum of Art, Cornell University, Ithaca, NY, 1988-89; "Joan Mitchell: Les Dernières Années, 1983-1992" at the Galerie Nationale du Jeu de Paume, Paris, 1994; and "Joan Mitchell: Oeuvres de 1951 à 1982" at the Museé des Beaux-Arts de Nantes, France, 1994.
beauty. As a non-ironic, dyed-in-the-wool abstract-expressionist, she worked in an idiom that was well established when she began, and was subsequently considered "passé" by some-- as was painting itself, even. In this sense, Klaus Kertess has rightly compared her achievement to that of Soutine and late Bonnard, artists who also did not "innovate" formally but found greatness by working within an existing painterly language and using it to explore and expand personal territory. A 48-page hardbound color catalogue accompanies the exhibition with an essay by Nathan Kernan.